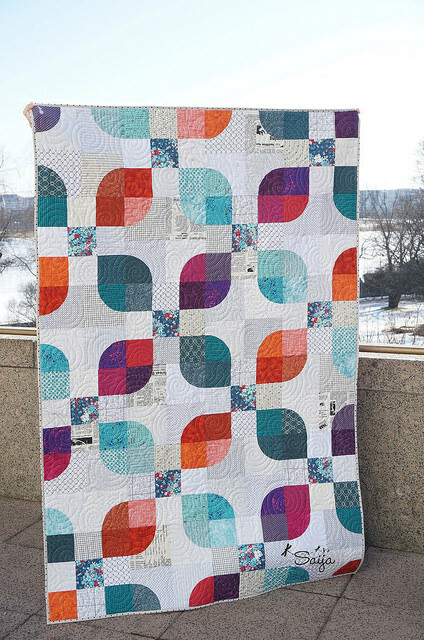 Hi my fellow quilters! 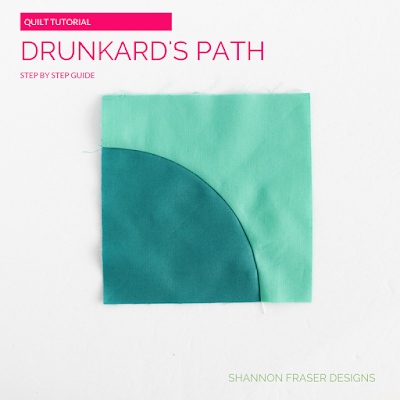 I'm Shannon from Shannon Fraser Designs popping in to talk about all things Drunkard's Path!! Being a history buff, the Drunkard’s path block was an interesting past to delve into! The design is believed to have originated in ancient Egypt but was popularized in the late 19th century by quilters in the American colonies. This is where it gets a little interesting. 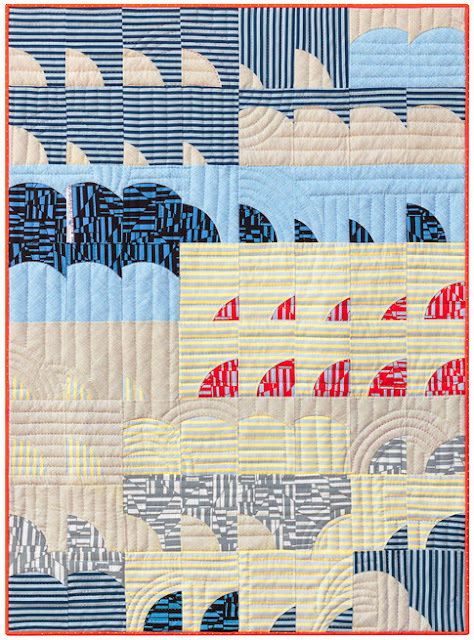 One story says that Drunkard’s path quilts were used to help guide slaves to freedom from the Underground Railroad. Different coloured squares would help guide their path to safety. Although this is highly debated. Another theory is that women used the design during the Women’s Temperance Movement in the early 20th century as a way of making their opinions known and trying to bring influence when they couldn’t vote. The block itself is even known by many names such a Solomon’s Puzzle, Rocky Road to Kansas, Oregon Trail, with the most popular being Drunkard’s Path. The latter is said to have been attributed as the design of the block looks like a drunk person stumbling home. 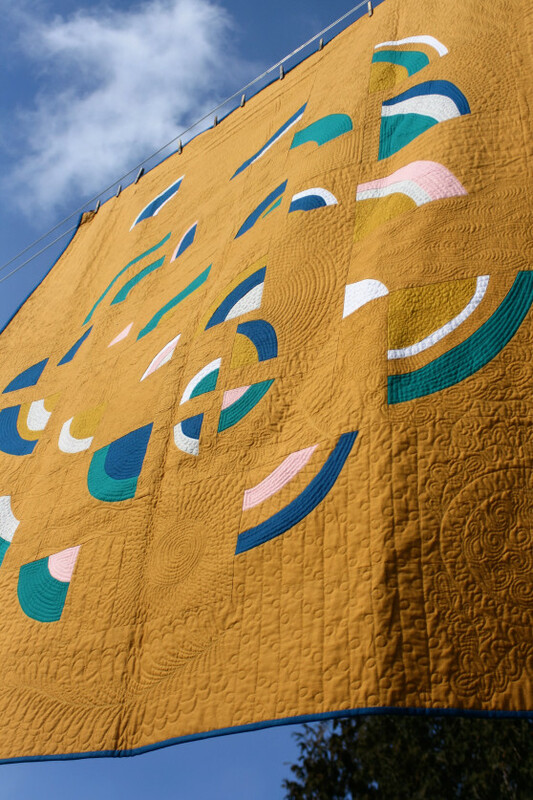 Whatever the history, what we can agree on is how fun this quilt block is to play with! The traditional block design features one “hill” against a solid background. Traditionally, the colours used in this quilt design were blue or red against a white background. 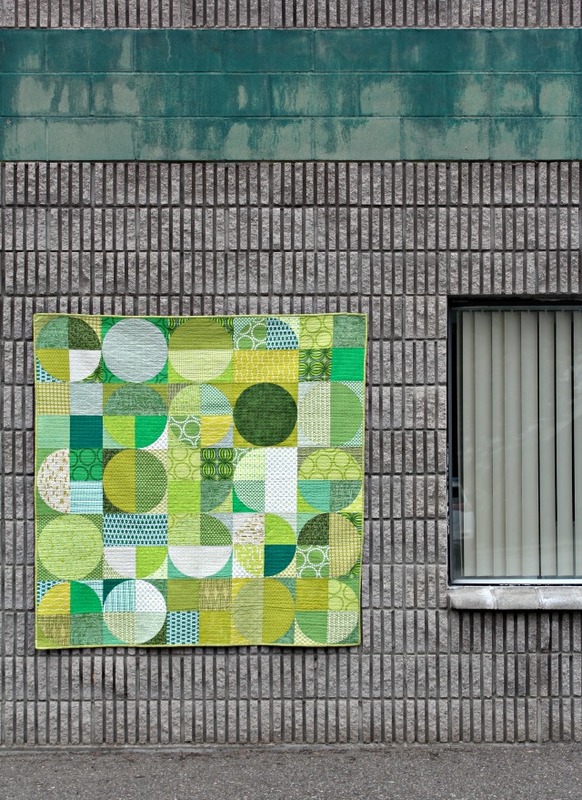 Circles can be a source of stress for a lot of quilters, but piecing the block is quite easy – you just need to take your time with it! Fabric (1) large square at least 7" and (1) smaller square 5 ½"
To keep everything aligned, the key here will be accurate cutting and piecing. 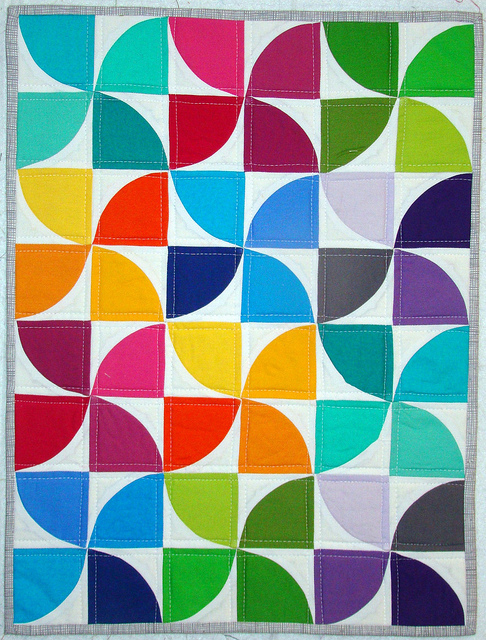 Plus, pins will most definitely be your friend when piecing the traditional block! Start by cutting the “L” shape of your Drunkard’s path block from the 7" block. Lay the template so it is flush with the bottom left corner. Carefully cut along the curved edge of the template. 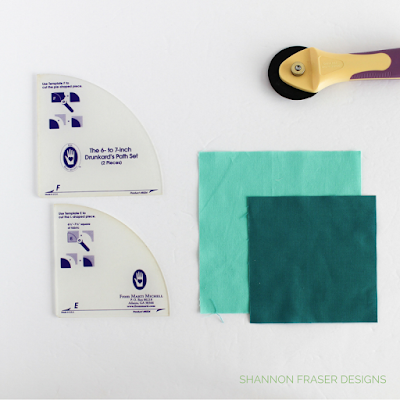 Repeat the same process with the 5 ½" square using the “pie” template. 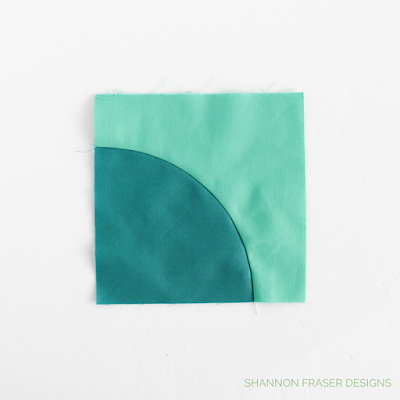 Fold the “L” and “pie” shapes in half finger pressing, being careful not to pull or stretch the fabric. Lay the “L” piece on top of the “Pie” shape lining up the folds. Pin. Now pin each of the corners, making sure to line up the square edges. Continue pinning in between these pins. Stitch in place using a ¼" seam allowance. Take your time! 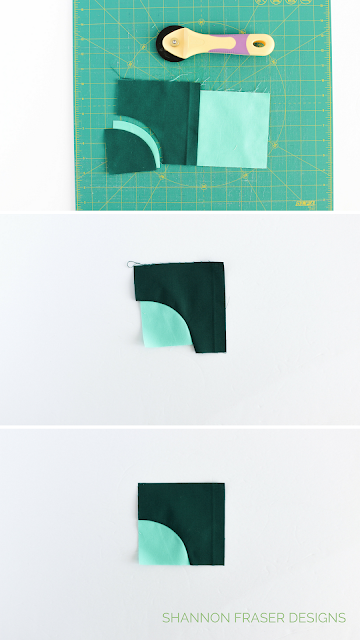 Set your seam with a hot iron, and press towards the “L” shape. Voilà – you’ve made a Drunkard’s Path block!! You can add as many “hills” as you want and it’s all achieved using the above method. Once you know the technique, you can apply it to any size Drunkard’s Path block. To make a really big version, you often won’t find a template large enough for your needs. Nothing a large plate can’t fix! Start by laying your large 13" square out on your cutting mat. Using a large plate, align the edge of the plate along the 7 3/4" horizontal line on my mat and 8 1/2" along the vertical line. 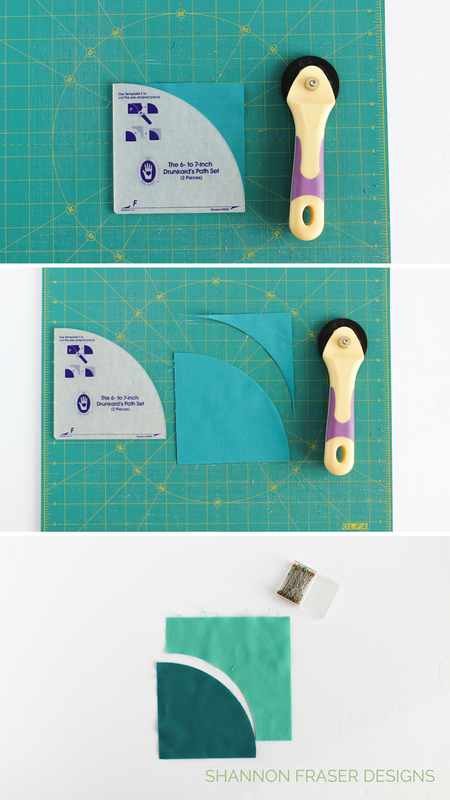 With your rotary cutter, cut along the edge of the plate. This creates your “L” shape. 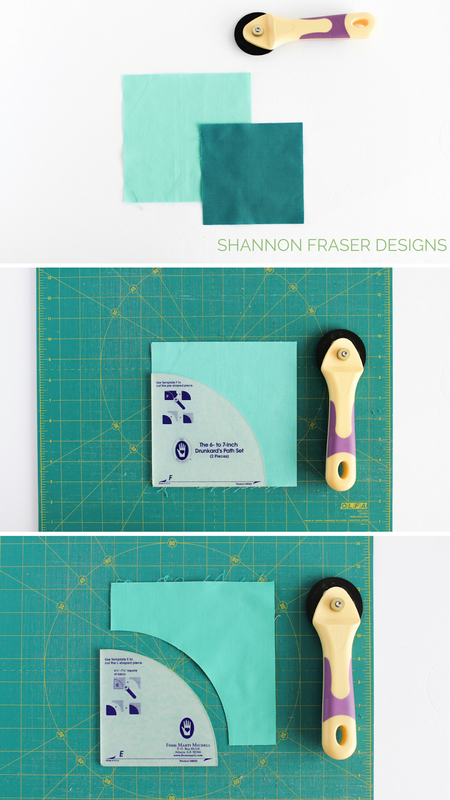 Use the “Pie” you cut from the “L” shape as a template to cut your “Pie” from your 9” square. Lay the square out on the cutting mat, place the “Pie” on top and carefully cut along the edge. 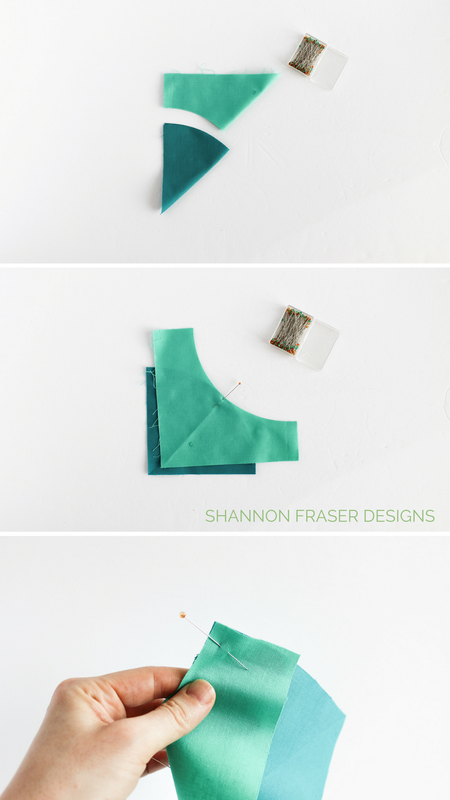 Stitch together using the traditional pinning method described above. Square up to 12 ½". The technique is the same no matter what size block you want to achieve! What I particularly love about the Drunkard’s Path is approaching it with an improv flare. This version abandons all use of templates and rulers to rely on your own freehand cutting style (the latter gets developed more and more with practice). I love that this approach doesn’t require many tools. There is no precise cutting here and I forgo any pinning as well. Here’s a video to help show you exactly how you can use this technique too! 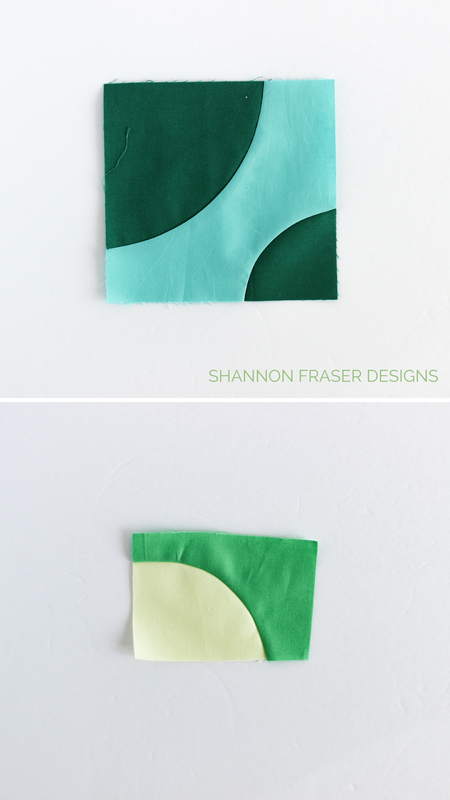 To make more at once, I like to stack a couple of fabric squares on top of one another before I start cutting. Next, using my rotary cutter, I haphazardly cut a semi circle from one edge of the block to the other. Don’t worry if your line is wonky or uneven – that ads to the charm, in my opinion. 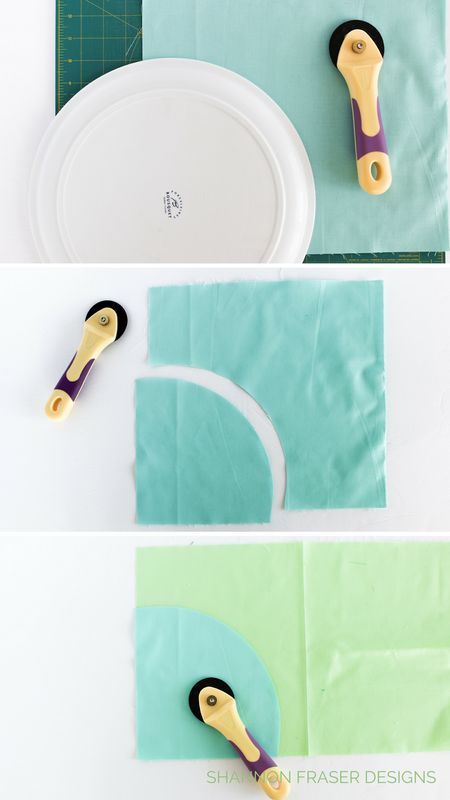 Now swap the mini circles with the larger “L” shaped pieces. Always working with the “L” shaped piece on top, line it up with the edge of your mini circle. Take a few stitches and then gently ease the top fabric edge along the curved edge of the bottom piece of fabric. You don’t want to pull or stretch the fabric into place, but rather just gently place it in alignment. Take a few stitches. 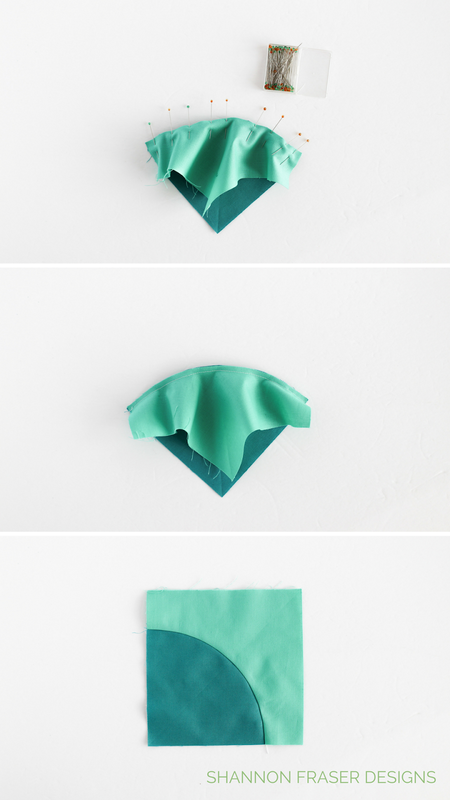 Stop and arrange the fabric. Keep going until you get to the end. 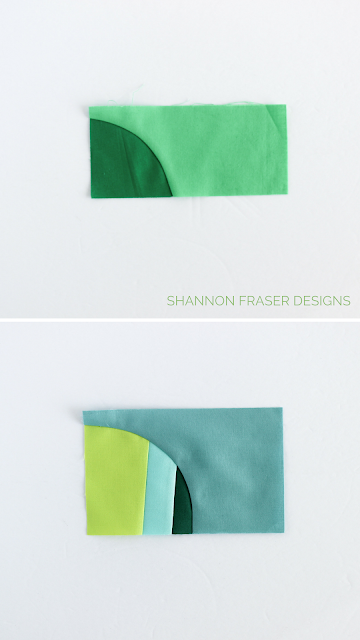 Make sure the top and bottom fabric are flat, so you avoid any puckers. When it comes to ironing, I find it best to first set your seam and then press away from the inner circle. I find this always helps ease out any bumps you may have created while stitching. Now that know how to piece the block, the real fun can begin! Here is where you need to let your imagination run free and think outside the box. This is a traditional block with an added “hill”. You can add as many “hills” as you want for a very different look. Here are some different interpretations of the Drunkard’s Path block to get your creative juices flowing! I've loved walking you through this tutorial. For some more inspiration please check out my Circles and Drunkard's Path board on Pinterest. Be sure to reach out if you have any questions. 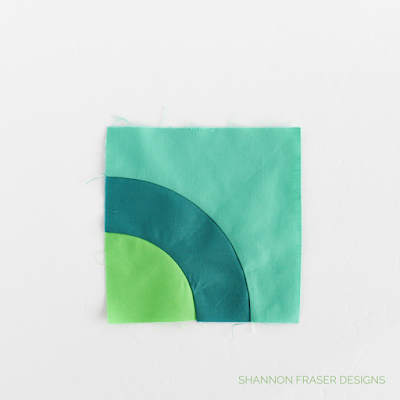 You can find me on Instagram, Facebook and over on my site Shannon Fraser Designs. Visit Montreal MQG's profile on Pinterest.